Performers include: Louis C.K., Hadley Delany, Todd Barry, Nick DiPaolo, Ashley Gerasimovich, Robert Kelly, David Patrick Kelly, and Jay Russell. 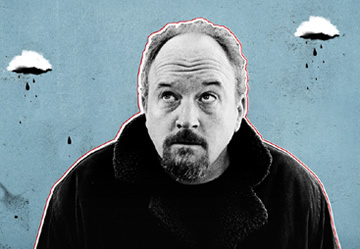 This comedy series is created, directed, and written by Louis C.K., a standup comedian who previously starred in a more traditional sitcom on HBO, Lucky Louie. Loosely based on his real life, this series focuses on his life offstage as a recently divorced father of two girls. Each episode of the series focuses on two stories, which may or may not connect. They also include standup comedy bits and/or discussions between Louie and a therapist. Louie’s character of a comedian/divorced father of two is the only character to appear in every show. While most of the story shows Louie’s interactions with new characters, there are also recurring characters, including his brother Robbie (Robert Kelly), his daughters Lilly and Jane (Hadley Delaney and Ashley Gerasimovich), his therapist (David Patrick Kelly), and fictionalized versions of comedians Nick DiPaolo and Todd Barry. Episodes often include guest appearances by other standup comedians, such as Jim Norton, Robert Kelly, Rick Crom, Eddie Brill, Chelsea Peretti, Hannibal Buress, Rick Shapiro, Todd Glass, Myq Kaplan, and Ricky Gervais. Actors sometimes appear in guest starring roles as well, including Matthew Broderick and Pamela Adlon. Louie continues his work on the road. First aired: May 28, 2015. What do you think? Do you like the Louie TV show? Do you think it should have been cancelled or continued for a sixth season? Louie: Plans Cancelled? Will There be a Sixth Season? @tay: Returns sometime this summer.